Aspect-oriented software design (ASOD), which follows the Java philosophyof "write once, run anywhere", is a new way of thinking about programconstruction. It is a rapidly growing and evolving programming methodologythat some feel may eventually replace object-orientation as the dominantprogramming paradigm. The first public release of the AspectJ programminglanguage was in 1998 and has been gaining momentum ever since. 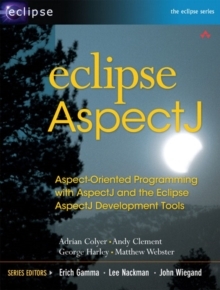 This book isan introduction to AOP with AspectJ and Eclipse and shows how to create aproductive AO development environment by using the AspectJ DevelopmentTools for Eclipse (AJDT). Tools have an important role to play in learningaspect-orientation (AO) and Eclipse tools help Java developers betterunderstand AOP. In fact the growing interest in AOP can be attributed to thebetter available tools and this book teaches the reader everything they need tounderstand AOP and apply it successfully to their own projects.